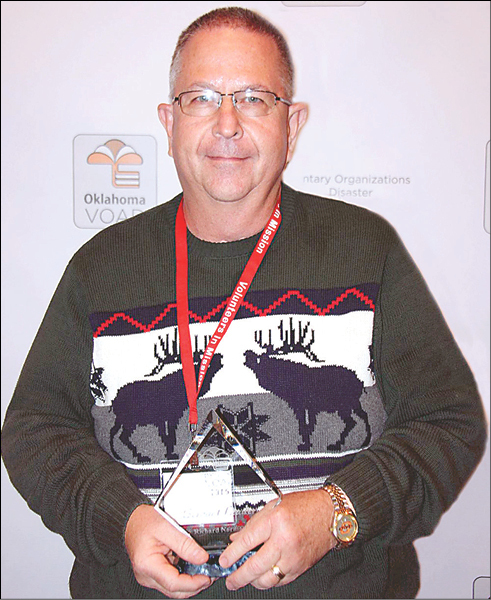 Richard Norman, who is the Conference’s disaster response coordinator in the Office of Mission, recently received the Servant Leader award from the partnership group called Oklahoma Voluntary Organizations Active in Disaster (Oklahoma VOAD). The members of this nonprofit collective share knowledge and resources throughout the cycle of disasters — preparation, response, recovery, and mitigation. Rev. Norman was honored for recruiting volunteers as case managers and project managers, to assist disaster survivors in Oklahoma. He also has spoken at churches to bring awareness of disaster recovery needs and has taught leaders in a number of communities to set up and operate long-term recovery committees. His award was presented during an Oklahoma VOAD meeting at Camp Egan.